This is the ambitious question Dr. Kwon and his lab are setting out to answer by looking at the brain in a whole new way. In a study published in the journal Nature Biotechnology in June 2017, Dongmin Lee, Ph.D. and Jung Ho Hyun, Ph.D., post-doctoral researchers in the Kwon Lab, describe a new tool they’ve developed to identify and control neurons. The new technique, called Calcium and Light-Induced Gene Handling Toolkit or “Cal-Light,” allows researchers to observe and manipulate the neural activities underlying behavior with never-before-seen specificity, hopefully allowing researchers to identify causality between neuronal activity and behavior. Up until now, researchers who wanted to observe neuronal activity in real-time often used a technique called calcium imaging. 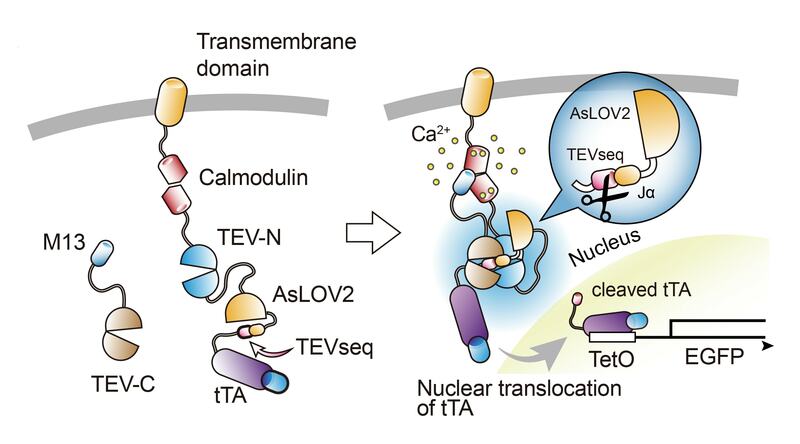 The technique takes advantage of the fact that actively firing neurons receive an influx of calcium. Tagging the calcium ions with fluorescent dye makes it easier to watch them fire in real time, but it doesn’t tie them to specific neuronal populations. To show that the Cal-Light technique is effective, Dr. Kwon’s group tested it first in cell culture, and then in vivo in a mouse model. In the model, the team used the technique to identify, label, and manipulate a population of neurons in the motor cortex that fired when a mouse pushed a lever to receive a reward in response to a stimulus. Once the neurons of interest were identified and labeled, his team presented the stimulus to the mouse while optogenetically inhibiting the group of neurons. When cells were inhibited, the mouse no longer pressed the lever, demonstrating that the activity of these cells was necessary for the mouse to carry out the behavior.